The Radio City Music Hall premiere was February 11, 1938. Tommy Kelly and Ann Gillis (Becky Thatcher) were brought in for guest appearances with several local tie-in merchants (here they are at Wanamaker’s Department Store for a Lincoln’s Birthday luncheon attended by NYC kids and parents). Selznick’s zeal for perfection resulted in the usual cost overruns. 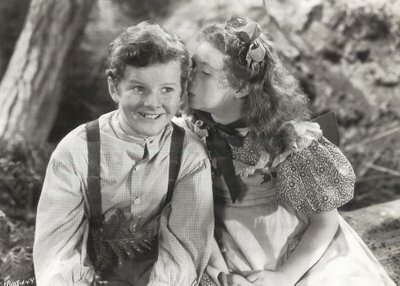 The Adventures Of Tom Sawyer ended up at $1.2 million spent, and getting that back would prove difficult. Domestic rentals stalled at $1.1 million, and foreign returned a modest $743,000. The final loss was $302,000. I checked out the ledgers for a small-town North Carolina house that played The Adventures Of Tom Sawyer in April of 1938. That exhibitor paid United Artists a flat rental of $100.00, among his highest outlays for a single feature that year (only Test Pilot commanded a higher price --- $163.60). In addition to Tom Sawyer, there was a cartoon from Paramount (Educated Fish at $4.80) and a Metro newsreel ($3.00). $12.30 was spent on posters and accessories. 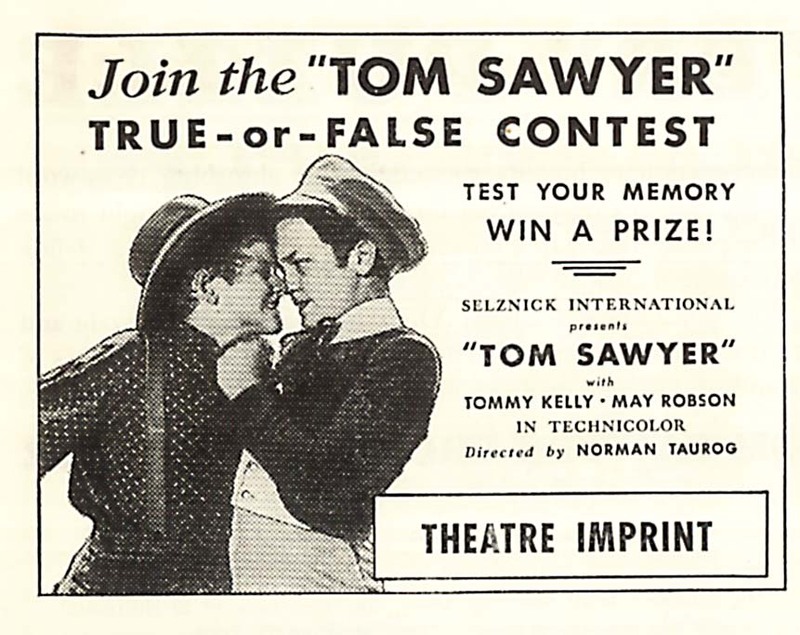 This particular showman’s loss reflected the nationwide deficit on Tom Sawyer. $78.90 came through his boxoffice for the two days it played. When you consider the total cost of the program ($107.80), plus the usual house overhead, this was clearly a losing engagement. Re-issues of Tom Sawyer would have cleared some of the red ink, but probably not all. Eagle-Lion leased the film for a 1948 revival, and later there was NTA’s 1958 distribution (our Liberty Theatre played it as their big Christmas attraction that year). 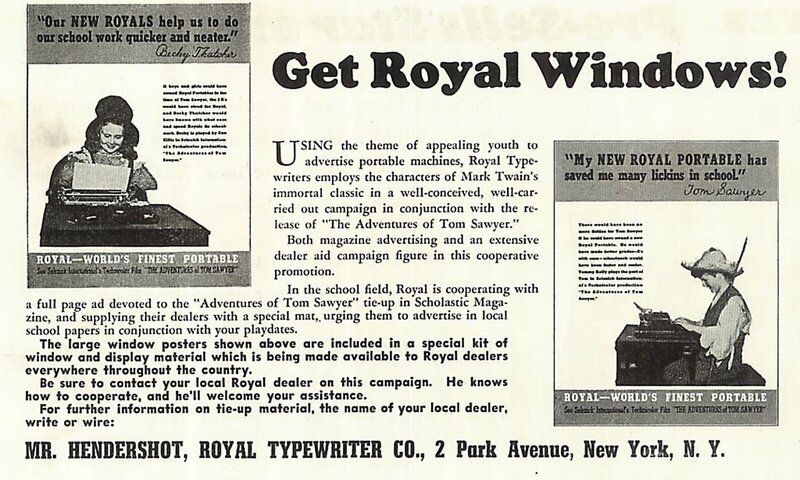 A company called New Trends Associates brought The Adventures Of Tom Sawyer back in 1965. There were cuts made to its negative over the course of time. The 93 minute feature was eventually winnowed down to 77. An extensive restoration was finally made when Disney took ownership in the early nineties. A friend and Greenbriar reader who was involved with that project generously provided the following background information …. The Adventures Of Tom Sawyer was quite a project. The restoration, perhaps, took the foolish long way around rather than the quick and easy way, and reconstituted the 3-strip negatives. They had been trimmed in several hundred places -- by Selznick himself – in 1952 for the subsequent 1954 reissue (Technicolor’s negative cutter’s notes dated 1952 were still in the elimination cans!). 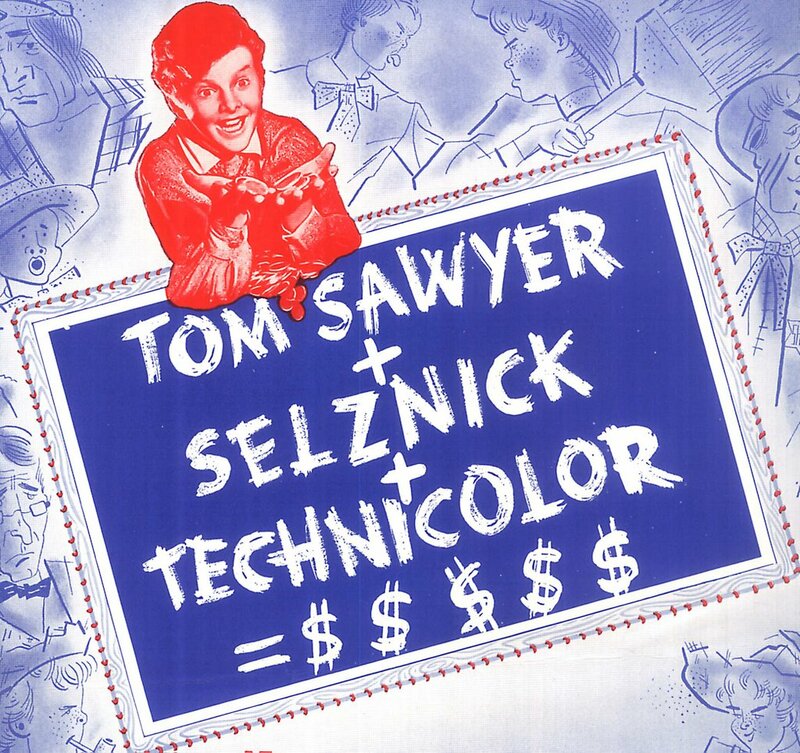 Interestingly, Selznick had Technicolor make him a new safety print just before he had the negative cut up ( that print is now at Eastman House; it has a nasty yellow-red-amber color, like so many late ‘30s IB prints). The evidence suggests that it was made from 1938 matrices, with 1952 matrix pick-ups for damage at reel ends – there will be a definite pre-print splice, and the last 75 feet of the reel suddenly goes from amber pre-war Technicolor to neutral-balanced post-WW2 Technicolor! There seemed to be an edict to get the picture down both for time and to make it play faster with a more modern (1950s) pace -- this is just my assessment looking at how the cuts were made, with entrances and exits truncated, reaction shots removed, everything happening more swiftly in many scenes. The long version existed in 1938 nitrate Y-C-M masters, but they were dreadful quality – what’s been seen before from Playhouse Video and MoMA was from this stuff, just terribly: grainy, dirty contrasty and color shifted. When all of the trims were found, stacked in cans abandoned at one of the archives, it was determined to piece the long version back together even if it meant jump cuts, because the photographic quality was so superior. And some of the trims were 5 and 10 frames at the head and tail of shots. Perhaps the ideal solution would have been 100% digital, but the cost to do that at proper resolution would have been astronomical. Several scenes were done digitally where full 3 strip negatives did not exist, and elements had to be mixed or there was bad damage. Additional clean-up of photographic dirt and tears was done to the high-definition video master (the restored version has not been released in the US, and is not the copy that was shown on TCM, though it sired a beautiful DVD in the UK – get your multi-zone player folks!). The sound, too, was an issue -- it was pulled largely off of Selznick's 1952 safety print, which was the best existing track made from the lost original sound negative. Brief sonic holes were filled with re-recordings in the ABC inventory to fix holes and splices, and an original music and effects track allowed the sonic quality of non-dialogue passages to be upgraded for Signal-to-Noise. Interestingly, the 1954 reissue has an entirely new mix - some music cues swapped around, slap-echo reverberation added to the cave sequence, other changes. We went back to the original mix, and at the same time, we restored the 77m. version as well. If anyone cares to, it makes a nice comparison study. Commercially, the short version is useful as the foreign dubs prepared after the war were of this short version, so we wanted to be certain that those markets that had existing tracks could have the picture in the local language (until the day that new dubs of the long version are done). This short version work was done in Video-Only. The original 1938 trailer, a rather long one, was also restored from a nitrate print located with a collector. Tommy Kelly (Tom) moved back east, and at last we heard is still alive. The word is that he became a High School teacher (now retired). Disney tried to locate him when they showed the picture at the El Capitain several years ago, but no luck. Ann Gillis (Becky) lives in England (she appeared in Kurbick’s 2001:A Space Odyssey as Gary Lockwood's mother in the video birthday greeting!). Cora Sue Collins (Amy Lawrence) is alive and well in LA – she has a wonderful scrapbook she assembled on the set of Tom Sawyer full of signatures and drawings from the cast and crew. David Holt went on to a successful career as a songwriter (often working with Johnny Mercer) and sadly left us a few years ago. Marcia Mae Jones (Mary Sawyer) lives in Los Angeles, and that beautiful face is still instantly recognizable. Jean Porter, later Mrs. Edward Dmytryk, was one of the schoolgirls. 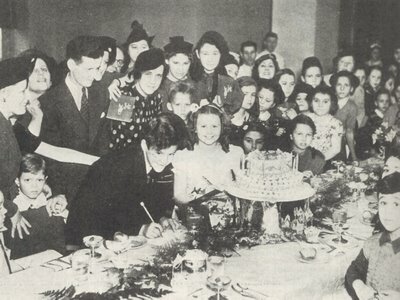 Just recently we learned that Walt Disney’s “Alice” star, Virginia Davis, was also one of the school girls! There actually is one shot left in the film, in the church when the boys return for their “funeral”, where you can see Spring Byington as the Widow Douglas; she clearly had a large role in the original version. Stills exist of her, lantern in hand, discovering Tom asleep in a haystack at night. And those opening title shots of Tom swimming -- well, that's the sequence Walter Brennan refers to in the jailhouse when he says he's the one that shows the boys the good fishing spots! Again, there are stills that show this was an entire sequence of Tom and Huck swimming, while Muff fishes from his skiff. Stills also reveal that the entire cemetery scene was re-shot on a new set designed by (and I guess the scene may have been directed by) William Cameron Menzies. The original set is a dull four-walled affair hemmed in by a picket fence; the doctor is dressed in a waistcoat and broad hat. Leave it to Menzies to make it a properly horrible scene suitable to grave robbing – tumble down gravestones, bent wispy trees reaching out with leafless branches like fingers, the graveyard silhouetted on a promontory, the doctor now in Inverness cape and top hat. What an orbit this poor picture has had! 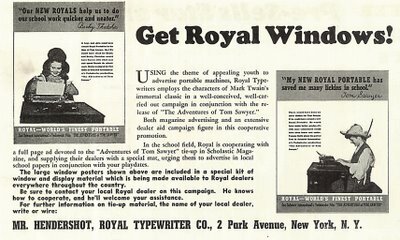 How fascinating to see an ad incorporating the word "Windows" and people at keyboards in 1938! I know I'm getting repetitious, but what a tremendous site this is. I've read that the financial take of The Wizard of Oz was negatively affected by the lower ticket prices its disproportionately large kiddie audience was paying. I wonder if Selznick had that same problem with Tom Sawyer? I just wanted to thank you for this wonderful retrospective of a film that captures the SPIRIT of Mark Twain, something that films based on Twain's work seem to rarely accomplish. And let me second your call for everybody in the U.S. to get an all-region player; they're not expensive, and they're worth it even if you only buy this film, the restored Laurel & Hardy films, and the mammoth French boxed set of more than 100 Betty Boop cartoons. Thanks for this great two-parter on Tom Sawyer, John. I saw this at a first run theater in St Pete Florida in 1977. Never could figure out why they picked it up but I was glad to get to see it in 35mm. The cave sequence had me on the edge of my seat. Interesting to note that when Technicolor saw the rushes for the cave sequence, the cinematographer, Jame Wong Howe was warned that the scenes were too dark and he was expected to lighten them up and show some color. He ignored them and was banned from using Technicolor equipment for some time after. In any event I'm glad he stood his ground. 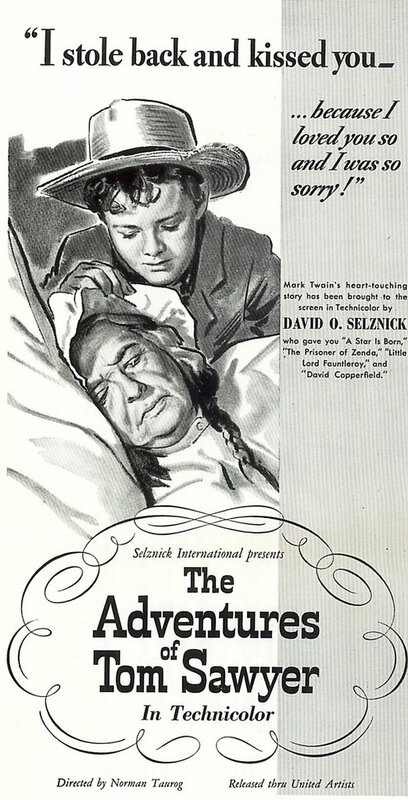 I also recall a poster dealer in the early eighties finding dozens of original Tom Sawyer one-sheets in mint unused condition, I wondered at the time if Selznick had turned in a large poster order and bookings fell short resulting in alot of unused posters. 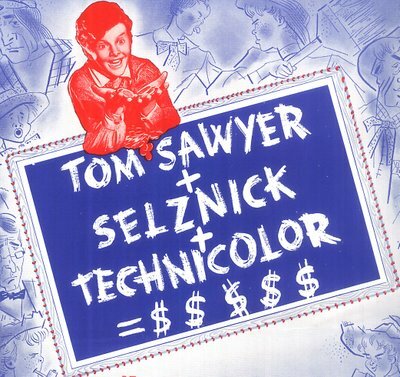 I saw SAYWER on TCM and the color was really strange(bits of color surrounded by a gray sacale)Wha hoppen?